I found this funny little bench on Sunday and thought of Jude. I was out for lunch, somewhere I’d never been before in south Devon, disappointing and I won’t be going back, but there were a few things to see. And then in situ. I know Jude liked the walk I posted here, so I think this is one she’d actually like to visit. If you have a bench to share join in here. There’s still a few days for Jude’s bench challenge, this month it’s benches with people or other objects on them. 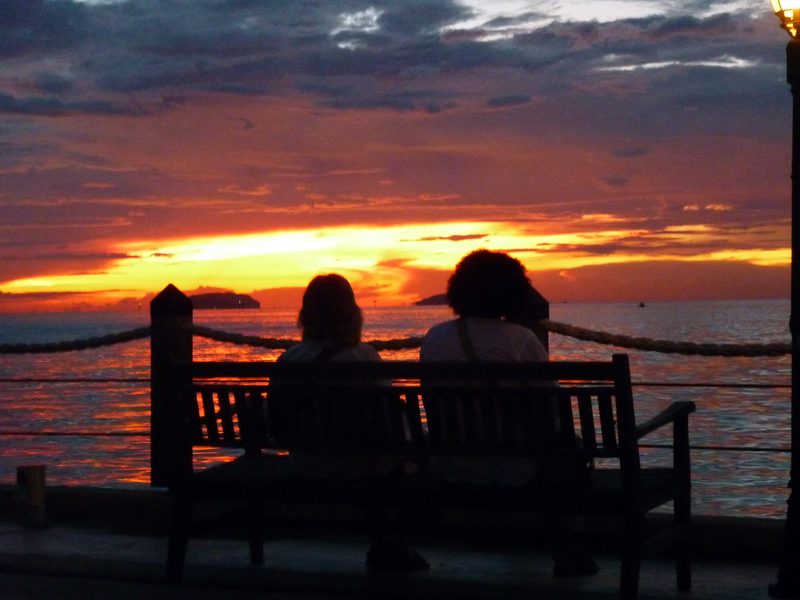 This one was taken a few years ago on the waterfront at Kota Kinabalu. I’ve always felt that the blurriness gives it a slightly dreamy quality as the people gaze out on the islands of Tunku Abdul Raman park. What could they be thinking as they enjoy the view, is their conversation interesting, or perhaps they are silent? Do you have a bench photo to share with the world? visit Jude, she’ll explain!
. . . If Jude knows where this bench is? I took this photo several years ago, but I’ve been sending things to the cloud from my PC, so that I can access them on my laptop and it popped out and shouted Jude at me. Jude’s bench challenge this month is about occupied benches, and I’m probably too late for this Sunday, heyho such is life. As the days get shorter, cooler and much more damp I can’t help but look back on summer and wish it wasn’t leaving. I’m not a winter girl, and the misty, drizzly start to today wrapped around me and lowered my mood for most of the morning. A similar low seemed to have invaded several others in my office too, with one person talking constantly all day, but only to himself and all negative. I’m at home now and it’s a new month for Jude’s bench challenge. I’ve had this month’s entry planned since June – remember June? those wonderful days when the sun didn’t set until nearly ten pm? That’s when I’m happiest. To be honest September has been pretty good as well, with an adventure in Portugal, where I found some more benches and wonderful places to explore. I think Jude will know this bench, I’m sure she’s sat there and if she hasn’t she will! It looks quite exotic doesn’t it? St Ives on a glorious day is just that, and this view is certainly worth lingering over, especially if you’ve already bought one of those Cornish ice creams. Pop over and see Jude’s ‘Diana‘ bench if you can find it. 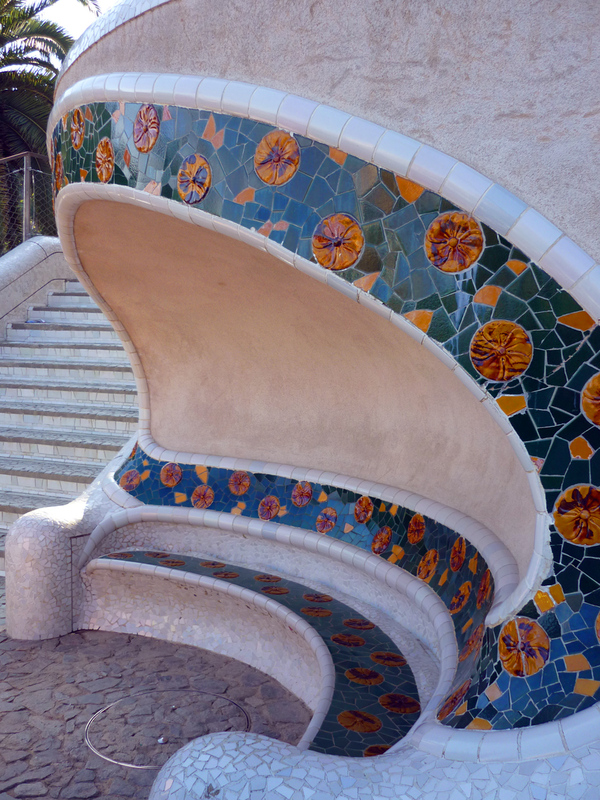 He created a colourful bench for my August post for Jude, and placed it in Parc Guell, in plenty of time for my visit to Barcelona in April. If you would like to join in visit Jude here, she has a different bench theme every month this year. Benches with unusual features for July, do you have one? Jude’s bench challenge this month is ‘unusual detail’. I’ve had each month’s topic in mind when I’ve been out and about this year and I found this one in early April. It was up a little alley in Glastonbury, opposite a shop, and to be honest I wouldn’t choose to sit there when there are so many cafes and places to people watch in that colourful town. That’s another post I must get round to – some pics of the streets in Glastonbury, its a hippy dippy place even when it isn’t festival time. If you have a bench with unusual detail, maybe you would like to join Jude’s challenge? Edit a bench photo for my challenge Jude says, give it an art effect! Well it seems I’ve forgotten all the tricks I used to know. Using android has made me lazy and I can’t find anything in Photoshop. This is what I came up with, but that was yesterday and now I have no idea how. Uppark is a National Trust property perched high on the beautiful South Downs ridge. My photo is of the Gothic bench, that had a wonderful view of the surrounding countryside. Most memorable for me at Uppark, was being told off for daring to turn a few feet aside to look at a painting, when the guide wanted to frogmarch everyone ahead! That’s what I thought when I saw this one at Lympstone last week. I immediately wondered how it would look with a touch of processing for Jude’s challenge this month. I only used two steps to create this effect, first of all I cropped away a big expanse of dull brick wall and paving in the foreground. Once I was happy with the content, I tried a few filters and decided that Photoshop Elements Ink Outlines within artistic/brush strokes was all it needed. Jude’s Bench Challenge for June is to process and image with an arty effect, hooray, that’s licence to play! I’ve used Photoshop, Pixlr and Snapseed to create this image, but I can’t remember what steps I took to get to the end result. The photo was taken on the beach path at Dawlish Warren in February. The perspective makes it appear that its a row of single seats but they are in fact benches for two or three peopel. I do quite like the end result and I expect I’ll try some more this month. Perhaps you’ll join in too?